We really like muffins for weekend breakfasts in the Fuss Free household, but somehow I have got out of the habit of making them. It used to be a weekly ritual, I’d whizz up a batch – experimenting with a new flavour and Ed would go and get the paper and then make coffee. These days the paper is delivered wirelessly to the iPad, but that is not an excuse to forgo our muffins. This week (3rd – 8th February) is Bramley Apple Week – and a good excuse to celebrate these delicious British cooking apples. Everyone knows that Bramleys are too sour to eat raw, but delicious when cooked with their fluffy melt in the mouth texture and full apple flavour. Eating or dessert apples are never as good cooked, often chewy, because they contain up to 20% more dry materials than a Bramley. Despite being an autumn fruit, apples which have been stored properly are still in peak condition. I’ve paired my Bramleys with goat’s cheese and thyme, despite their intrinsic sourness this recipe needs no extra sugar. For a sweet apple contain bake why not try my Dorset Apple Cake. 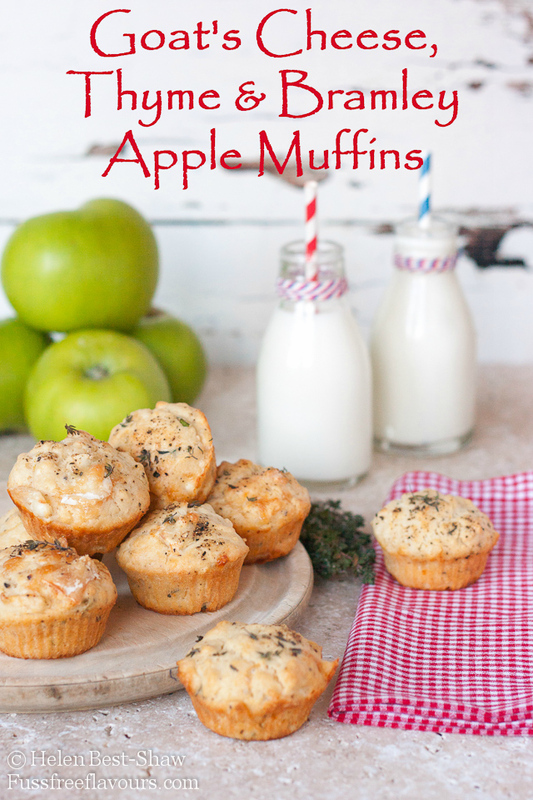 If you try this Goats Cheese, Thyme and Bramley Apple Muffins please tag #FussFreeFlavours on Instagram or Twitter. It is amazing for me when for me when you make one of my recipes and I really do love to see them. You can also share it on my Facebook page. Please pin this recipe to Pinterest too! Thanks for reading Fuss Free Flavours! Whisk the oil, milk and egg mixture with a fork. Add the wet ingredients to the dry and fold together (the batter should be lumpy and mixing should take no more than 15 folds). 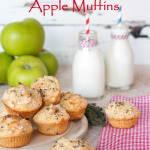 Dollop the mixture into cupcake cases (paper or silicone) and sprinkle each muffin some of the reserved cheese and thyme. Bake at GM5/190C/375F for 25 – 30 mins until risen and golden.